Cancun Studios Photographers » Do you have to be a good swimmer for Underwater Photos? We get asked this question all the time. We can honestly say, only about 30% of our clients are excellent swimmers. You don’t have to be a great swimmer or a swimmer at all to have an underwater photo session. You just have to leave the magic to us and enjoy the photo session in Mexico. Our lovely Korean honeymoon couple had trouble swimming in the deep areas so we stuck to shallow, safe areas and were able to capture some great photography! 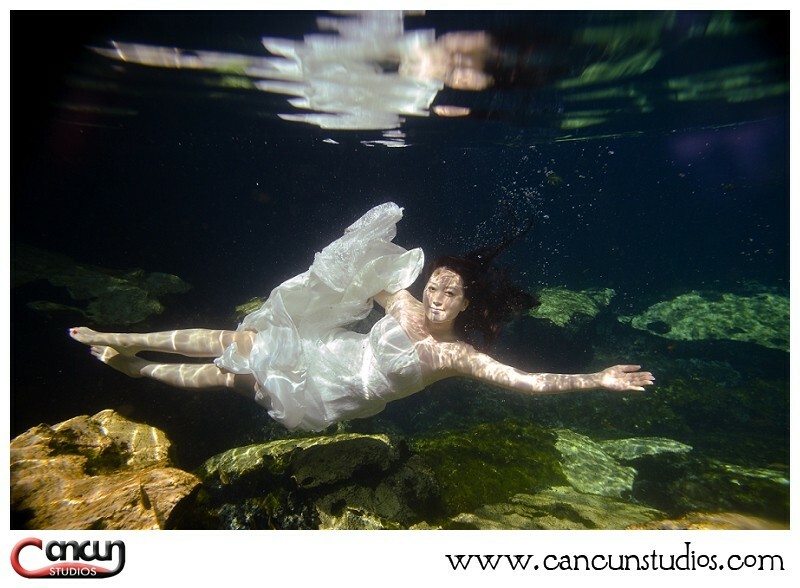 Book your underwater cenote photo session today! We are experts in underwater photography in Cancun. My husband and I booked a private boat on June 2nd at Isla Mujeres for fishing and swim with the whale shark and would like to hire a photographer to photograph us under the water with whale shark and the whole excursion day in general. The boat trip will be about 6-7hrs and boarding early morning at 7.30am. I just want to check with you to see if this is something that you can do and you are available on that day. Please let me know the cost of you are available. Thank you!